Emetophobia is the fear of getting sick and vomiting. 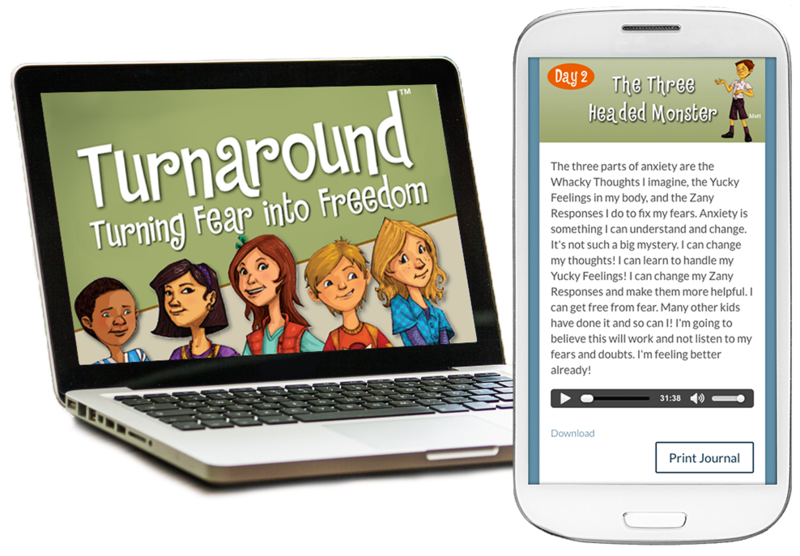 The digital Emetophobia supplemental resource is designed to work with the Turnaround program. The Turnaround program speaks directly to your child and teaches her or him effective strategies to overcome their fears. The Emetophobia supplement is designed to educate and guide parents so you can take your child step-by-step through the process to overcome this fear. This is also an effective resource for therapists treating patients with emetophobia. **The supplement is available only as a download. Flash drive and CD’s are NOT available. What emetophobia is and how to best explain it to your child. Detailed instructions in how to guide your child through the 5-step process of overcoming emetophobia. This process is explained in principle in the Turnaround program but described in detail in the supplement. You will be equipped to help your child, learning to use the same tools that Dr. McCarthy and Dr. Russ use when working with their patients. How and when to use the complete companion PDF packet, which includes cut-out illustrations, stories, drawings and images, and links to provide you with everything you need to help your child overcome this difficult fear. If you have any problems ordering, please contact us at 877-300-7436 or email us at sales@turnaroundanxiety.com. You can pay by paypal, paypal express or credit card in the next stage. Emetophobia is the fear of getting sick and vomiting. It’s a very common fear that can lead to school refusal, worry with germs, restricted food intake, and many other anxious symptoms (click here for a list of symptoms). If your child’s fear is getting sick, vomiting, or being around others who are sick, then this resource is what your child needs! 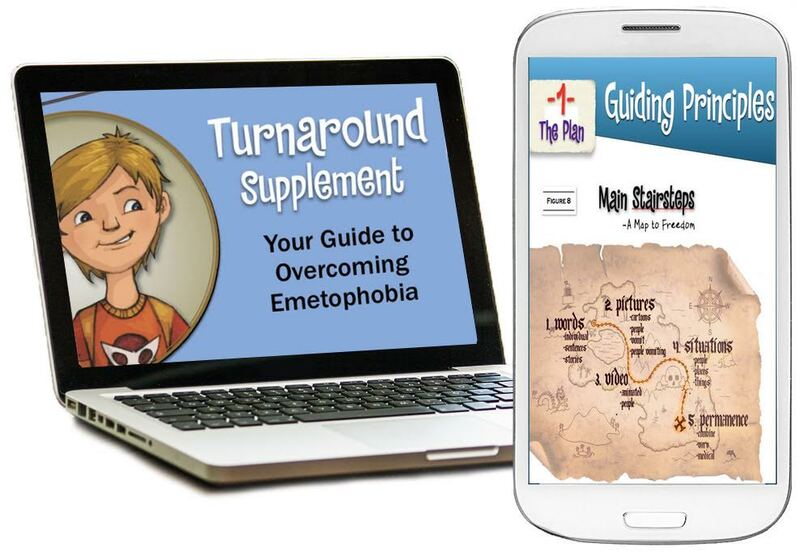 The Emetophobia supplemental resource is designed to work with the Turnaround program. 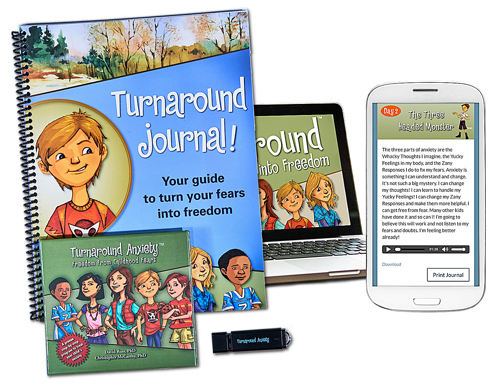 While the Turnaround program speaks directly to children with effective strategies to overcome their fears, the supplement is designed to educate adults so they can help a child to go through the step-by-step process of facing and overcoming the fear. Detailed instructions on how to guide your child through the 5-step process of overcoming emetophobia. You will be fully equipped to help your child, learning to use the same tools that Dr. McCarthy and Dr. Russ use when working with their patients. How and when to use the complete companion PDF guidebook, which includes cut-out illustrations, stories, drawings and images, and links to provide you with everything you need to help your child overcome this unique fear. We know of no other resource that provides such a comprehensive program to assists parents (or therapists) with everything they need to help their child overcome emetophobia. With personal, detailed teaching from Dr. Russ and Dr. McCarthy, you can’t help but be successful with this, guaranteed! There is a 30-day unconditional guarantee with a full refund. This supplement is designed to work with the Turnaround program is not meant to be a standalone program. Do you have a friend of relative who you think could benefit from our product? Use the form below to send them a message. I came across this product for childhood anxiety and thought you might be interested. The turnaround program is giving hope to children with anxiety around the world. An award winning, proven treatment program for kids suffering for kids that can be done at home.